Retribution of Cyryst: Ossyan + Elara vs Molik Karn... and some other warlock guy. 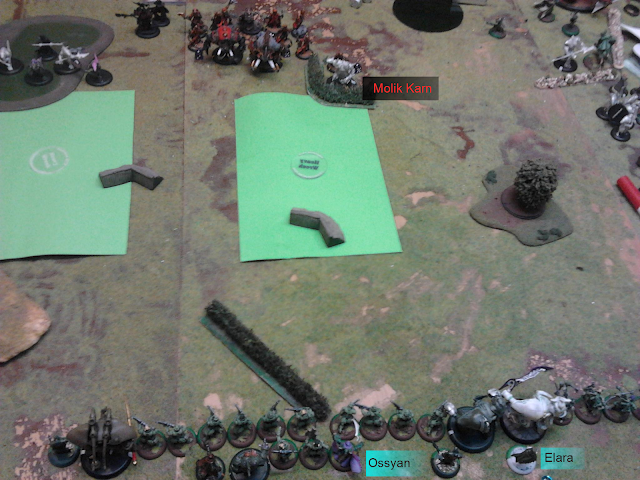 Ossyan + Elara vs Molik Karn... and some other warlock guy. As part of my continued championing of Elara I had a game with her and Ossyan. I wanted to run her with 1 of 2 Banshee, but I didn't want to proxy. So the list was as follows. Some emo who could cut himself to generate fury in a pinch. Molik Karn went first by sitting behind a hedge and ordering the rest of his army to walk into the gun line, in the style of 18th century warfare. Ossyan Quickened the Pheonix, put Admonition on Hype and advanced behind the hedge. 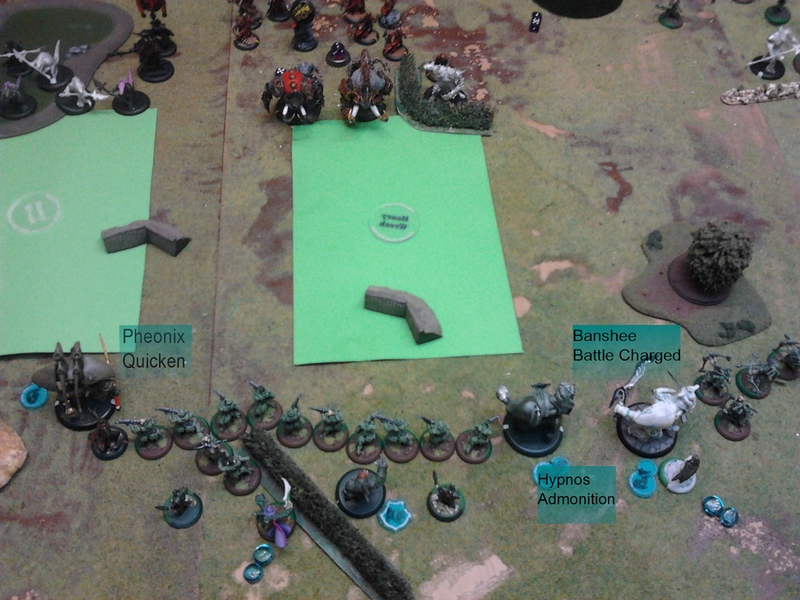 Elara put up Battle Charged and advanced with the Banshee. The artificer went up and Kinetic Fielded for the sake of it. I'm sure something happened, but it apparently didn't. Molik I know sat behind the hedge some more had his krea hang around and be annoying to shoot at and sat in the zone with his gators. Ossyans feat marked in the faded green spiral was just short of the Titan. The Magister popped forward and pulled the Bronzeback forward, then Ossyan went to the left of the Invictors and shot it, tagging it with a Chrono Phage and putting some damage on it while popping his feat. The Pheonix then shot it and put a good chunk of damage on it, followed up by the Invitctors shooting without combines but mini feating. It was dead before the last 3 fired and it was when I measured up their range I realized I just barely missed the Titan in my feat. Hypnos walked up and Void Locked him and the Banshee went up to knock it down and try position for a counter charge. There is no excuse for leaving the other Titan out of my feat, I am just bad. Molik Karn deems is necessary to do something. So the solo yells at the bronze back to stand up, which does and walks over to smash the Objective. 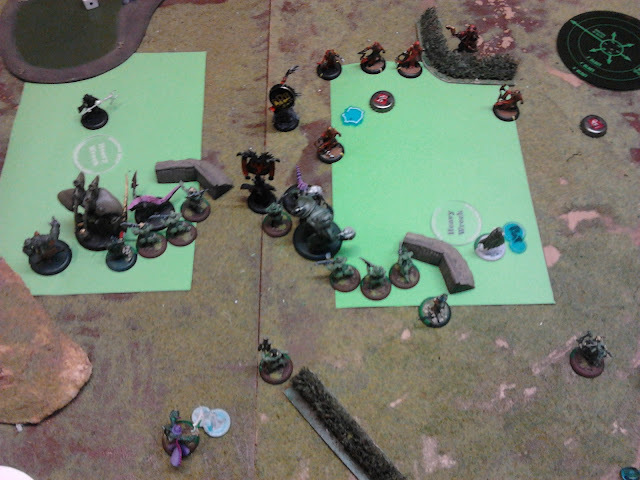 The Banshee was ina bad spot, figuring Molik could just walk up and wreck it so it counter charged to put some damage on the Titan before it took Molik to the face. It put a bit of damage on the Titan and the Titan wrecked the Objective. 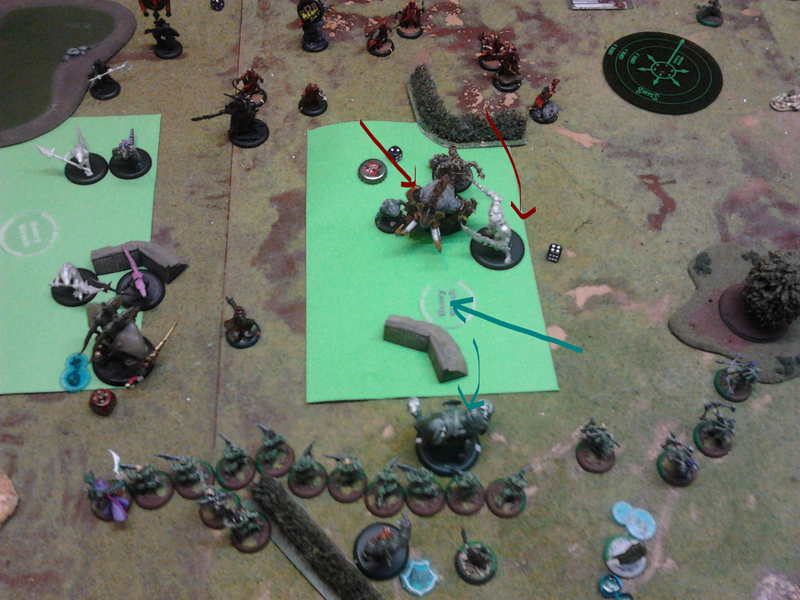 Molik walked over the hedge and Hypnos Admonitioned away but OUT of the zone, oops. 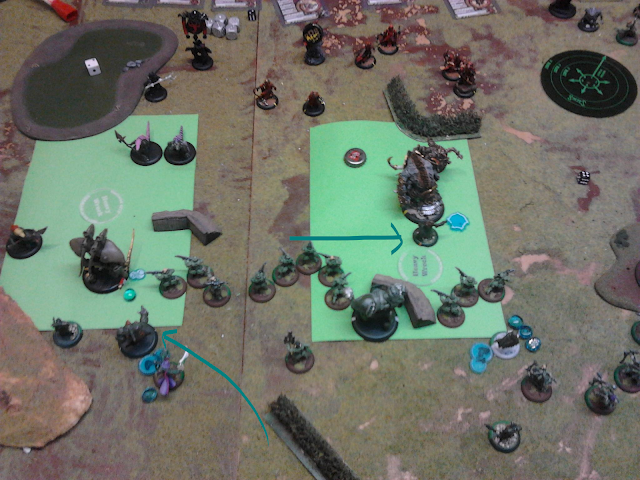 Molik smashed the Banshee and he scored 2 points that round. On the other side the Pheonix jerked around with some Gators. 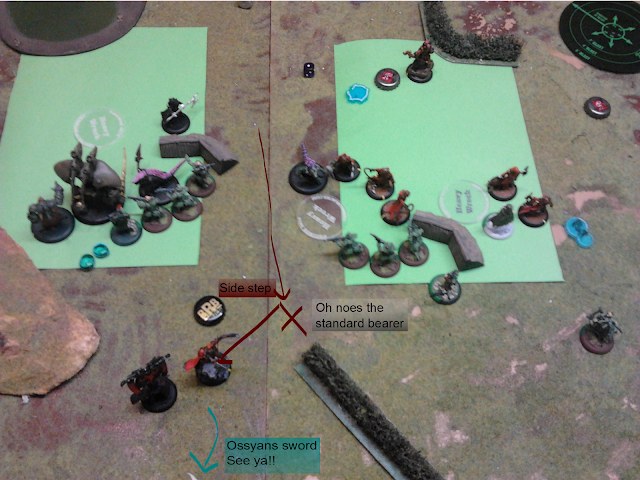 Ossyan went first, tagging the Titan with a Chronophage catching Molik inside it and dropping admonition on himself. The Magister charged Molik and Combo Smited him to knock him down, there the Stormfall archers who had other wise done not much at all put some serious hurt on him. The Invictors finished him off and helped pick out a Gator and some pain givers. Most of the Invictor flank attacks were ineffectual, Elara with the stormfall finished off the Krea or Drake or whatever it was, Hypnos was left on only his cortex and movement after the Titan smashed him up but with some lucky rolls and Ossyan firing into combat in a last ditch attempt I finally kill the Titan and sit back with Admonition up. Somewhere around here the Emo guy in the back as being so emo I couldn't focus at all. Emo mcStabbypants or Morghul or whoever he is, suddenly appears out from behind the back of the of the rest of the crushed Skorne army and while bouncing off the Invictor standard bearers face lands in front of Ossyan, who Admonitions away, aims, shoots him in the face and kills him with 2 Arcantrik Bolts. Elara was fine in this list, its a pitty I was over committed with the Banshee and didn't place the feat well or I might have had a bit more use out of it, but still without her I wouldn't have been able to slow the Titan down as much as I did so yay. Wow, the squiggles and stuff make it so I actually know what happened. Squiggles conveying information, its almost like another language!